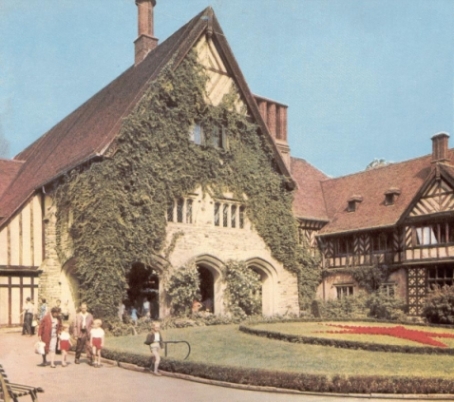 THE POTSDAM CONFERENCE of the three great powers, usually referred to as the "Berlin Conference" in official documents, opened on the 17th July 1945 in the Cecilienhof, residence of the former Crown Prince Wilhelm of Hohenzollern until the previous March. The Soviet Union was represented by J. V. Stalin and V. M. Molotov; the United States was represented by Harry S. Truman (its new President) and James F. Byrnes; and Great Britain was represented by Winston Churchill and Anthony Eden. Nine meetings had been held up to the 25th July when the Conference was adjourned for two days for the announcement of the results of the British Parliamentary elections. When the Conference was resumed on the 28th July, Winston Churchill's place had been taken by Clement Attlee, and Anthony Eden had given up his place to Ernest Bevin. The Conference continued until the 2nd August when the final agreement was signed by Truman, Attlee and Stalin. 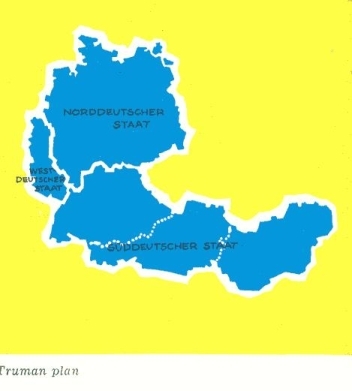 During the Potsdam Conference, Truman proposed that post-war Germany be divided into three parts: a North German State with Berlin as its capital, a West German State with Essen as its capital, and a South German State (to include Austria and Hungary) with Vienna as its capital. This was a variation on similar proposals put forward by Roosevelt at the Teheran Conference in November 1943, and by Morganthau (Secretary of the US Treasury) at the Quebec Conference in September 1944, except that the previous plans had not gone so far as to include Austria and Hungary, since it had already been agreed in Moscow (in October 1943) that Austria and Hungary should be restored to independence. The desire of the Western great powers for the division of Germany sprang from their reluctance to accept a democratic alternative. In the end, however, due in part to the strength of democratic feeling both in Britain and the USA at that time, all plans for the partition of Germany were rejected in favour of denazification, demilitarisation and democratisation. It was agreed that Germany should remain an entity and "be treated as a single economic unit" during the period of the occupation. "The purpose of this agreement is to carry out the Crimea declaration on Germany. German militarism and nazism will be extirpated and the Allies will take in agreement together, now and in the future, the other measures necessary to assure that Germany will never again threaten her neighbours or the peace of the world. It is not the intention of the Allies to destroy or enslave the German people. It is the intention of the Allies that the German people be given the opportunity to prepare for the eventual reconstruction of their life on a democratic and peaceful basis. If their own efforts are steadily directed to this end, it will ba possible for them, in due course, to take their place among the free and peaceful peoples of the world." "All arms, ammunition and implements of war, and all specialised facilities for their production, shall be held at the disposal of the Allies or destroyed. The maintenance and production of all aircraft and all arms, ammunition and implements of war shall be prevented ...All nazi laws which provided the basis of the Hitler regime or established discrimination on grounds of race, creed or political opinion shall be abolished ... All members of the Nazi Party who have been more than nominal participants in its activities shall be removed from public and semi-public office ... The judicial system will be reorganised in accordance with the principles of democracy, of justice under law, and of equal rights for all citizens ... Subject to the necessity for maintaining military security, freedom of speech, press and religion shall be permitted ...the formation of free trade unions shall be permitted." "In order to eliminate Germany's war potential, the production of arms, ammunition and implements of war, as well as all types of aircraft and sea-going ships shall be prohibited and prevented ... At the earliest practical date, the German economy shall be decentralised for the purpose of eliminating the present excessive concentration of economic powers as exemplified in particular by cartels, syndicates, trusts and other monopolistic arrangements. In organising the German economy, primary emphasis shall be given to the development of agriculture and peaceful domestic industries." In addition to the above, the Potsdam Agreement also dealt with reparations, the transfer of the city Konigsberg to the Soviet Union, war criminals, the independence of Austria, the western boundary of Poland, the future of Rumania, Bulgaria and Hungary, the transfer of German populations from Poland, Czechoslovakia and Hungary, the conclusion of peace treaties and ad- mission to the United Nations Organisation. "It would be equivalent to suicide if world peace were to be endangered by a US policy whose points of view have unfortunately gained the upper hand in the discussions of our military government in Germany." In an article on Germany, in the November 1945 issue of Labour Month!y, Peter Field noted that in the Soviet Zone of occupation "the whole Junker class" had been expropriated and deprived of their influence and that there were now no "trust magnates and monopolists" to contend with, but that in the British, French and American zones "the role of the big landowners and trust magnates in Germany has obviously not been understood." He warned that "the security of the world, as well as the future of Germany, make their removal from their present positions an urgent necessity." 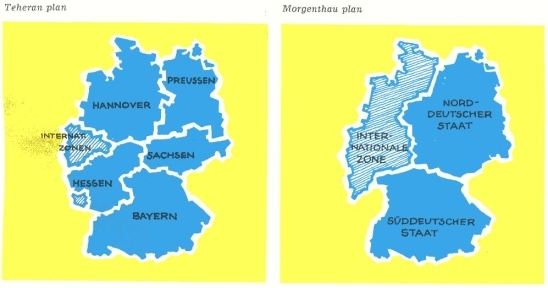 On the 25th February 1946, it was stated by Russel A. Nixon (Deputy Head of the Decartelisation Department of the US Military Government in Germany) before the Senate Military Affairs Committee, that: "at every level of the hierarchy of the US military government from one end of the US zone in Germany to the other, responsible officers are resisting denazification on the grounds that we must set up a bulwark against Bolshevism and Russia." Nixon also complained that decartelisation was being resisted for the same reason. He told the US senators how US officers in command in Hesse, Bavaria and Wurttemberg had taken sides with the German heads of trusts on the grounds that they were "our allies in the struggle against Bolshevism." After the breakdown of the London Conference of Foreign Ministers (called to decide on the future peace treaty with Germany) on the 15th December 19~7, General Clay, Commander-in-Chief of the US occupation troops in Germany, decided to come out into the open. In March 1948 he sent for Bronson, then head of the decartelisation department, and bluntly ordered him "to stop immediately all measures to loosen up the monoplies and disband the trusts." When the nineteen remaining officials of this department (all that was left of the original 150) signed a joint protest against this open breach of the Potsdam agreement, they were dismissed. On the 14th May 1948, the New York Times confirmed this "drastic change of course in America's decartelisation policy in Germany."